Almost from its inception, there had been a military and cadet component at West Florida Seminary (1851-1901), predecessor to Florida State University. With the commencement of the Civil War in 1861, this aspect of the school’s curriculum increased in importance, so much so that the State Legislature proposed changing the name of the institution to the Florida Collegiate and Military Institute. Throughout the War, the students served as something of a home guard, occasionally guarding Union prisoners of war and always on call in the event of a Federal threat to the capitol. In early March 1865, that threat was realized when word came that a Union fleet had landed troops on the Gulf coast at the St. Marks lighthouse with the probable intention of capturing the capitol in Tallahassee. The invading forces, commanded by Brigadier General John Newton, moved northward from the coast, hoping to cross the St. Marks River at Newport and attack St. Marks from the rear. Local militia was called out to delay the Union advance, and among those were cadets from West Florida Seminary. At noon on March 5, the cadet corps assembled at the school and marched to the state capitol where they were enlisted and sworn into Confederate service. 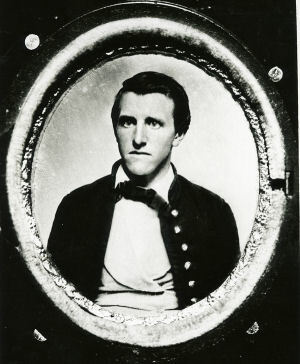 The cadet’s principal, Captain Valentine M. Johnson then led them to the Tallahassee train station for their journey southward to meet the invaders. Johnson was a veteran and had served honorably in the Confederate Army until 1863 when he was forced to resign for health reasons. It is nearly impossible to accurately determine the number of cadets that participated in the campaign. However, reasonable estimates put the number at around twenty-five, with their known ages ranging from eleven to eighteen. At the train station, Johnson filtered out those cadets, mostly the youngest of the corps, that would not participate. Others were left behind to continue their home guard duties and to man fortifications as a last line of the capitol’s defense. The cadets and other Confederate troops boarded a train in Tallahassee which carried them south to Wakulla Station on the St. Marks Railroad. From there, they marched six miles to the small village of Newport. There, in the late afternoon on March 5, they joined forces with a portion of Lieutenant Colonel George Washington Scott’s 5th Florida Cavalry Battalion and a small contingent of Confederate marines and militia. Scott’s men had skirmished with the Federal troops the previous day, gradually falling back from the East River Bridge toward Newport. It was at that bridge that the Union forces hoped to cross the St. Marks River, enabling them to move against St. Marks and perhaps Tallahassee. At Newport, the cadets occupied a line of breastworks running parallel to the river along its west bank. From there, they commanded the approaches to the East River Bridge, which Scott’s men had partially burned. Federal troops on the opposite side of the river still hoped to force their way across and a skirmish soon developed. By nightfall, the firing diminished, and everyone waited in their positions to see if the Federals would resume the conflict the next morning. It was in those trenches on the banks of the St. Marks River that the young cadets from the West Florida Seminary received their baptism of fire. 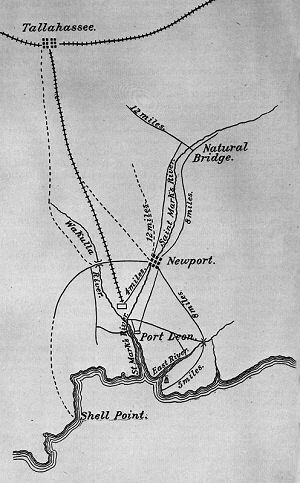 Newton, frustrated in his efforts to cross the St. Marks River at Newport, learned of another crossing upriver at Natural Bridge. At that location, the St. Marks River ran underground for a short distance, creating a natural crossing point. 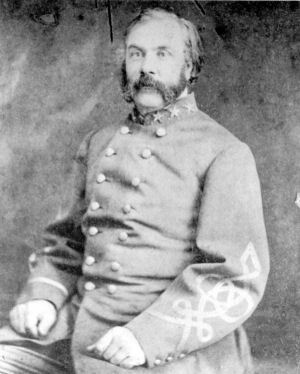 In anticipation of such a move, the Confederate General William Miller positioned Scott’s cavalry at Natural Bridge with orders to delay a crossing until reinforcements could arrive. At dawn on March 6, a battle erupted with the Federal forces unable to force their way across the span. The cadets were soon ordered out of their entrenchments at the East River Bridge and marched along the Old Plank Road to reinforce Scott’s men at Natural Bridge. One mile from the battlefield, two cadets peeled off to aid the wounded at a field hospital. The rest continued on, all the while the sounds of cannon and musket fire growing louder. With the arrival of reinforcements, the Confederate troops counterattacked, charging across the bridge and driving the Federal troops a short distance. At this instance, the Union General Newton, realizing that Natural Bridge, like the East River Bridge at Newport, was too heavily defended to cross, ordered a retreat back to the St. Marks lighthouse and the protection of the Federal fleet. The cadets were then ordered to return to Newport to guard against another attempted crossing there. However, the Federal forces had had enough, and the cadets’ active duty had come to an end. The Confederate victory against the Federal invasion was complete. Confederate casualties numbered three killed and twenty-three wounded (three mortally), with Federal losses totaling 148. The cadets from West Florida Seminary suffered no casualties. With the battle won, some of the cadets returned to Tallahassee, while others remained at Newport where they guarded two Confederate deserters that had crossed over to the Federal army and had been captured during the campaign. After the cadets witnessed their trial and execution, they escorted a group of around twenty-five Federal prisoners of war back to Tallahassee. On their return to Tallahassee, the cadets were welcomed as conquering heroes. A ceremony was held in the State House of Representatives chamber of the state capitol, where the cadets were presented with a company flag. Cadet Hunter Pope accepted the flag in the name of his comrades. It is uncertain what became of the flag, and it is thought that it returned with the cadets to the Seminary and was probably taken by Federal troops when they occupied Tallahassee after the War. The Confederate victory at the Battle of Natural Bridge had no effect on the outcome of the War, and in less than a month, Robert E. Lee would surrender the Army of Northern Virginia at Appomattox Court House in Virginia. The terms of Joseph E. Johnston’s surrender of the Army of Tennessee seventeen days later, included the surrender of Confederate troops in Florida as well. On May 10, Federal troops under the command of Brigadier General Edward McCook took possession of Tallahassee. The Federal army captured and paroled approximately 8,000 Confederate soldiers, including twenty-four cadets. It is thought that some of the cadets simply returned home after the surrender and before being formally paroled. Tallahasseeans fondly remembered the service provided by the West Florida Seminary cadets. Beginning in 1885, the state of Florida granted pensions to Confederate veterans, and two years later, they were also extended to home guard units, which included the cadets. Sixteen former cadets applied for pensions, while several others endorsed the applications of their comrades. 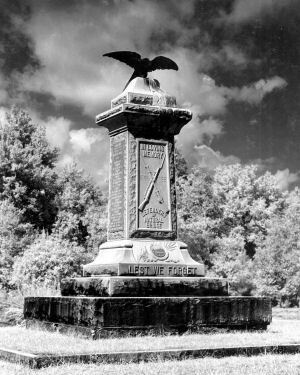 The Tallahassee chapter of the United Daughters of the Confederacy issued Southern Crosses of Honor to the former cadets who applied for the award, and they received tributes as “The Youngest of the Young Who Wore the Gray.” That phrase, forever associated with their participation in the battle, is inscribed on a monument at Natural Bridge Battlefield, which is today a state park. As a result of the cadet/students participation in the engagement, on February 28, 1957, the FSU Army and Air Force ROTC units were officially presented with battle streamers by Governor LeRoy Collins in a ceremony at Doak Campbell stadium. Today the Florida State University Reserve Officers’ Training Corps detachment is permitted to fly a battle streamer as a result of the School’s participation in the action at Natural Bridge. It is one of only three colleges and universities in the United States which is permitted to do so. In the 1990s, the campus ROTC Building was renamed the Harper-Johnson Building in honor of Captain Valentine M. Johnson and a twentieth century Air Force ROTC graduate who rose to the rank of general. For a fuller account of the battle, see David J. Coles, “Florida’s Seed Corn: The History of the West Florida Seminary During the Civil War,” Florida Historical Quarterly 77, no. 3 (Winter 1999): 283-319. 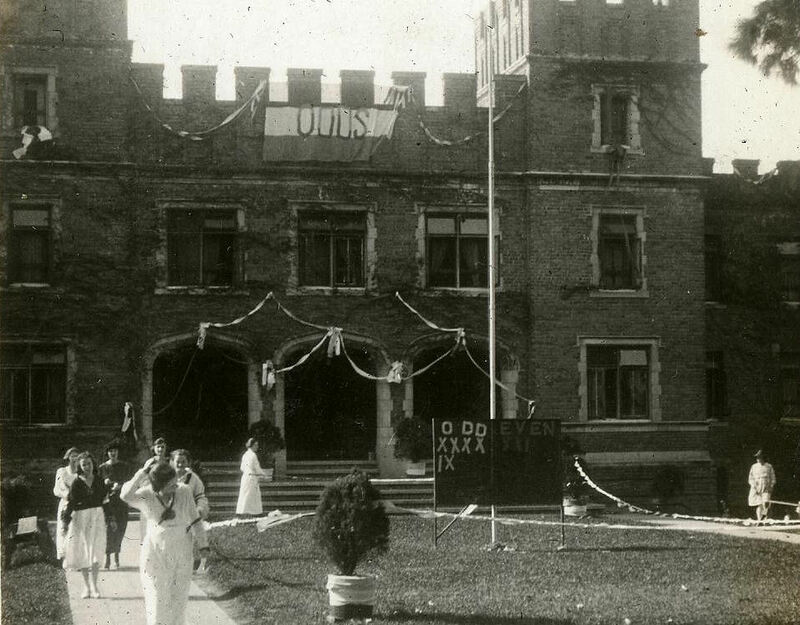 Held on the morning preceding the annual Florida State College for Women’s Thanksgiving Day basketball game, Color Rush first made its campus appearance around 1917. Color Rush was a series of races, by Odd and Even members, in which each team attempted to “capture” campus buildings by affixing their team’s colors to the highest point. The two squads tried to one-up the other, so much so that poles with red, white, and purple or green and gold ribbons extended beyond the rooftops. Later, for safety reasons, the colors were attached to the front doors of major campus buildings and other landmarks. Color Rush officially began with the morning bell, signaling the runners to race out of their dormitory rooms to tag the Administration Building, the Education Building, the dormitories, and other designated target points. In 1919, it was decreed that the fountain, a gift from the classes of 1915 and 1917, was “forever Odd,” and from then on, only Odd colors of red, purple, and white would adorn it. 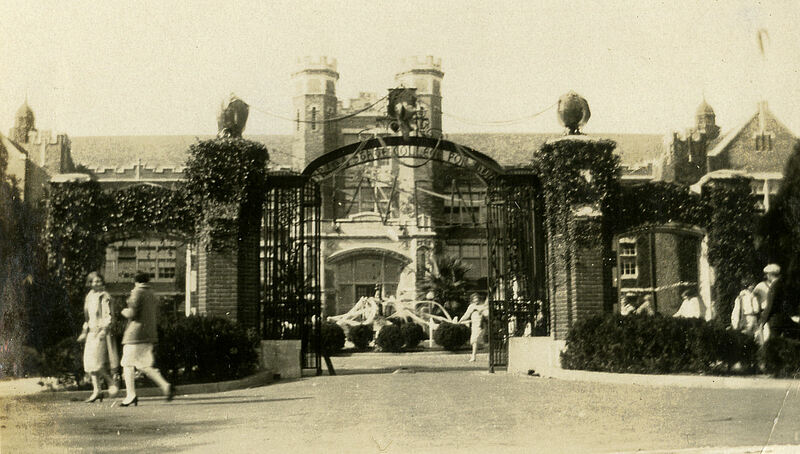 The entrance arch and brick piers, or main gates, presented to the college by the classes of 1916 and 1918, were declared “forever Even” and reserved for only green and gold from then on. Evens decorated the Dining Hall in even numbered years, and Odds in odd numbered years. As for the other buildings, the possession of the structure was determined by the runner from the side that first touched it. In 1921, the rules were changed again: from then on, each team selected a runner that lined up in front of Business Manager, John G. Kellum’s house at the corner of Copeland Street and College Avenue, just outside the main gates. From there, the runners raced to the campus buildings where official judges determined the winner. After the objectives were secured for the team, other members helped with the decorating of the buildings. Traditionally, Dr. Ralph Bellamy was the official starter for the Color Rush race for the Administration Building. Instead of using a whistle to start the race, he used his shotgun, with “On your mark, get set.” BOOM! After the event, the campus was said to be radiant with color. 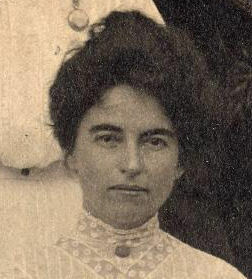 Born in Summerville, Arkansas in 1873, Inez Abernethy (or Abernathy) was the head of the Art Department at Florida Female College and Florida State College for Women from 1905 to 1914. She received her training at the Art Academy in Cincinnati, Ohio and then studied in Europe from 1896 to 1898. Between 1900 and 1903, she exhibited twice at the Salon Des Artiste Francais, and by invitation at the Academy of Fine Art in Philadelphia, and at the National Academy of Design in New York City. At various times she taught, and the year before taking her post at Florida Female College, she was an instructor in drawing and painting at the Summer School of the South in Knoxville, Tennessee. 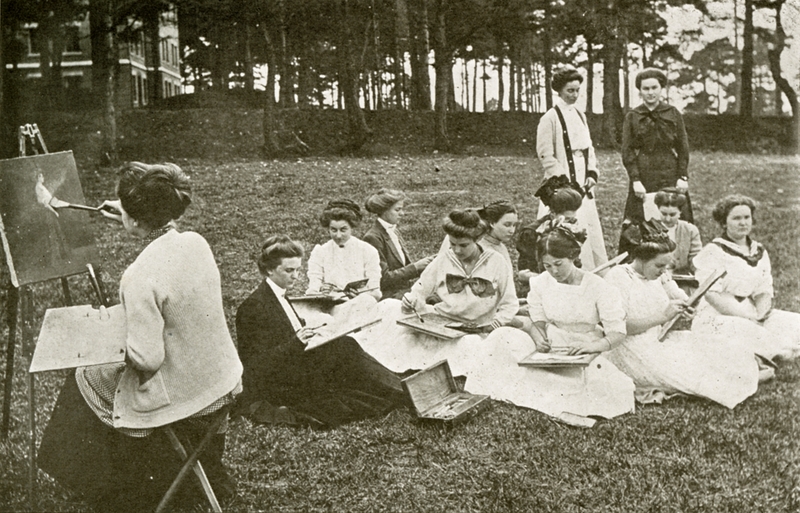 When she accepted the position as instructor in painting and drawing at Florida Female College in August 1905, she was informed by President Albert A. Murphree that the art equipment at the College was meager and inadequate. As a result, Abernethy brought her own collection of casts, models, drawings and oil paintings, which were used freely by her students. On December 22, 1906, when West Hall caught fire, Abernethy was serving as the faculty resident or matron on the second floor. When she learned of the fire, she sounded the alarm and worked tirelessly to wake the girls and get them to safety. Unfortunately, West Hall burned to the ground, and with it, her collection of materials in the Art Studio was also lost. During her tenure at FFC and FSCW, she also served on the the Pan-Hellenic Council and as faculty sponsor for Kappa Delta Sorority. She left the school in 1914 and moved to New York City where she went on to a successful career as an internationally acclaimed painter. From October 1935 to January 1939, she was employed in the Easel Division of the Federal Art Project, the visual arts department of the New Deal WPA. According to an article in a 1941 Flambeau, Abernethy was responsible for the two companion paintings, “May” and “October”, which were then on display in Reynolds Hall. She died in New York City on January 8, 1956 and is buried at Oakland Cemetery in Warren, Arkansas.